Rivalry weekend shakes up the playoff semifinal race. Six teams in this week’s College Football Playoff rankings lost during the weekend, including No. 4 Michigan, No. 7 LSU and No. 8 Washington State. While losses by West Virginia (13) and Utah State (21) effectively ended the teams’ hopes of earning a New Year’s Six bowl bid. Ohio State played its way back into the playoff discussion. 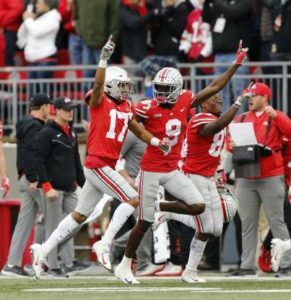 After a listless performance throughout much of this season, the Buckeyes made a huge statement Saturday with a dominant win over rival Michigan, scoring a series-high 62 points and handing the Wolverines their seventh straight loss in the series while making a case for a spot in the playoff semifinals. It’s back to the drawing board for Jim Harbaugh and Michigan. Once again, the Wolverines are forced to head into the postseason wondering, “What if?” after being completely dominated by Ohio State in all phases of the game Saturday. 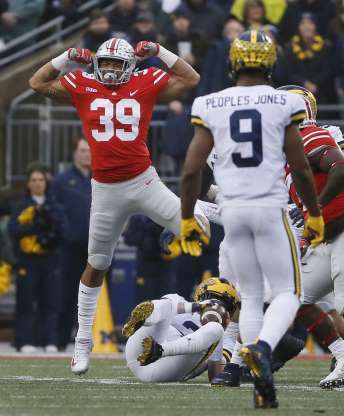 Michigan has lost 14 of the past 15 meetings with the Buckeyes. 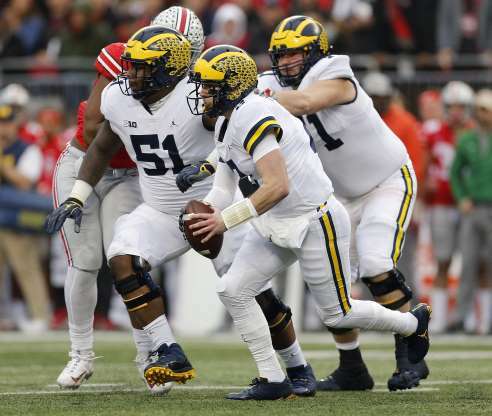 Even more disappointing, the loss likely knocked Michigan out of the playoff semifinals picture. Notre Dame’s perfect season should include a playoff spot. 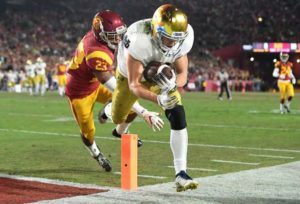 Notre Dame needed a second-half rally to overcome its biggest deficit of the season against a pesky USC team to finish the regular season undefeated for the first time since 2012. With four wins over ranked opponents, including Michigan, Syracuse and Northwestern, the Irish likely punched their ticket to the playoff semifinals. Alabama is playing on a whole other level right now. By dismantling Auburn in this weekend’s Iron Bowl, the top-ranked Crimson Tide demonstrated just how good this team is this season. 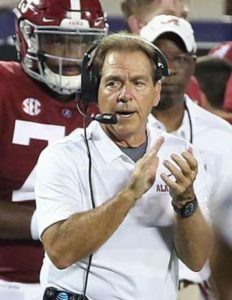 Alabama set school records for the most points scored in a season (588) while registering at least 500 yards for the 11th time in 2018 while making the case to remain the top playoff title contender. 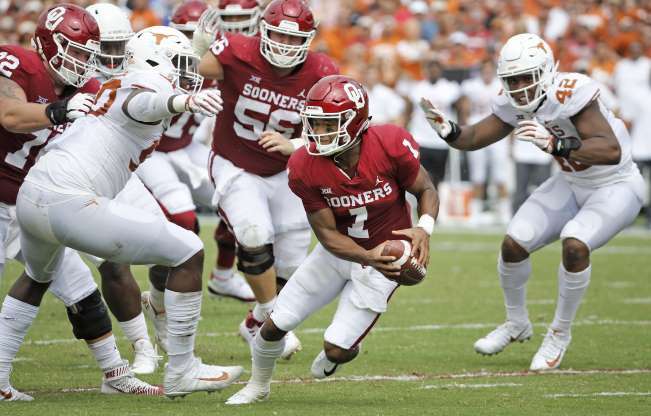 Texas remains the biggest roadblock for Oklahoma as it pushes to return to the playoff semifinals. Oklahoma handled business against West Virginia on Friday, setting up a rematch against Texas in the Big 12 Championship Game Saturday. The Sooners are running out of chances to impress the playoff selection committee and will need a win over the Longhorns and maybe some help elsewhere to earn a semifinal invitation. 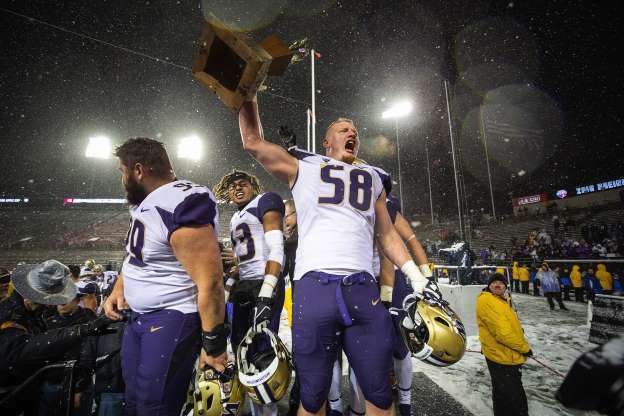 Washington State runs out of steam as the Pac-12’s playoff semifinals bid falls short again. Washington State needed a win over rival Washington to earn a spot in the Pac-12 Championship Game. Instead, the Huskies earned the win, abruptly ending the Cougars’ hopes for a conference title while also crushing the Pac-12’s chances of returning to the playoff semifinals for the first time since 2016.